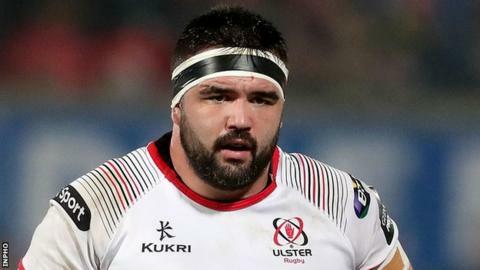 Ulster prop Marty Moore has been ruled out for the remainder of the season with an ankle ligament injury sustained in the win over Edinburgh last weekend. Ulster revealed on Wednesday that Moore will visit a specialist this week. Jacob Stockdale suffered a hamstring injury in the same Pro14 game at Murrayfield and his recovery is being "monitored on an ongoing basis". Utility back Will Addison was already ruled out for the rest of the campaign after undergoing back surgery. Former Wasps front row Moore hobbled off after just 10 minutes of Friday's game. Moore will miss Ulster's final regular Pro14 game of the season against Leinster on 27 April, plus more crucially their quarter-final with Connacht at Kingspan Stadium in Belfast on 3/4 May and any additional games the province may play. Ulster's 29-7 win over Edinburgh, allied with Munster's victory over Treviso, assured Dan McFarland's men of second place in Conference B and a place in the play-offs. The Irish province are hopeful that skipper Rory Best will have overcome an ankle injury sustained against Leinster in their Champions Cup quarter-final in time to face Connacht.